Black-Scholes-Merton (1973) SDE of geometric Brownian motion. 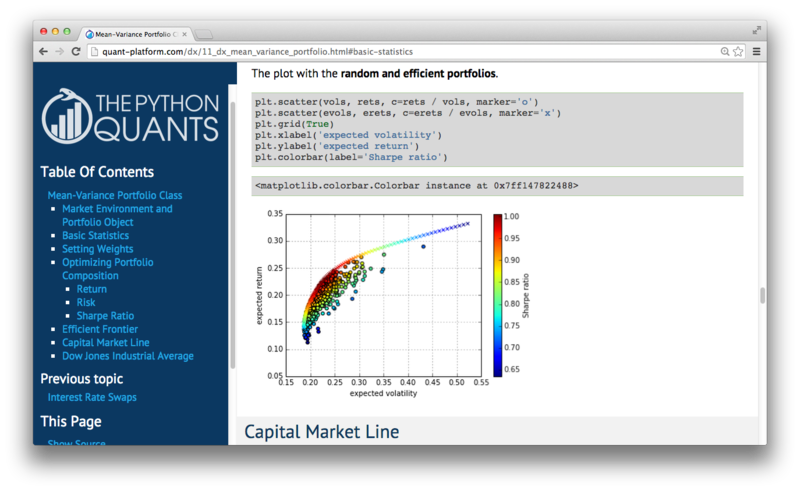 The "Hello World example of Quant Finance." The Python ecosystem can be considered one of the major competitive advantages of the language. 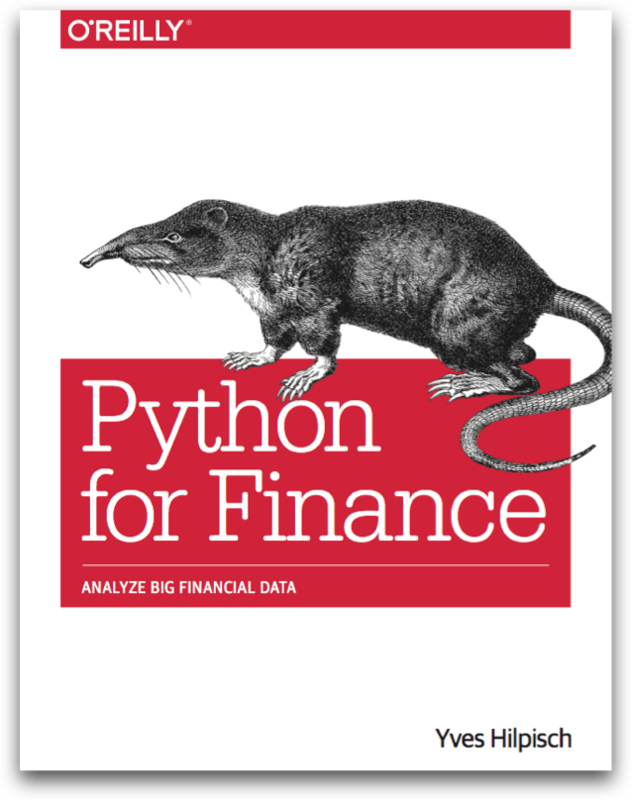 Python integrates pretty well with almost any other language used for scientific and financial computing. First, reading the EURO STOXX 50 & VSTOXX data. Let us generate a plot with fewer data points. Julia is, for example, often faster for recursive function formulations. As an example, consider the Fibonacci sequence. For comparison, an iterative function implementation. For final comparison, the dynamically compiled Python version with Numba. Julia: the "high-level, high-performance dynamic programming language for technical computing"
Important research milestones (I), from a rather personal perspective. Important research milestones (II), from a rather personal perspective. 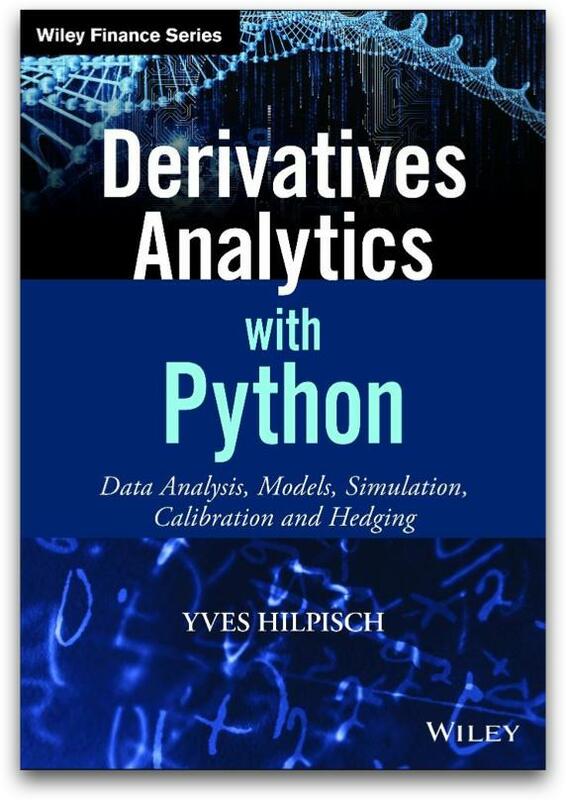 DX Analytics leverages the experience of using Python for derivatives analytics since about 10 years. 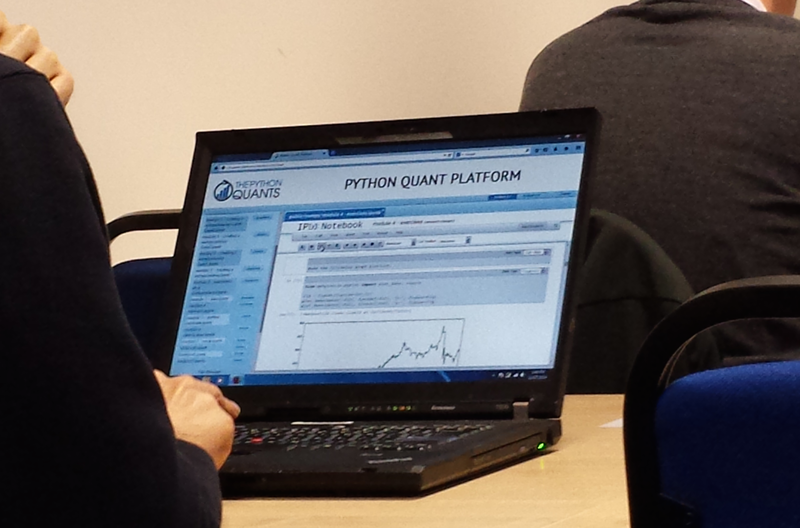 You can register for a PQP trial (incl. 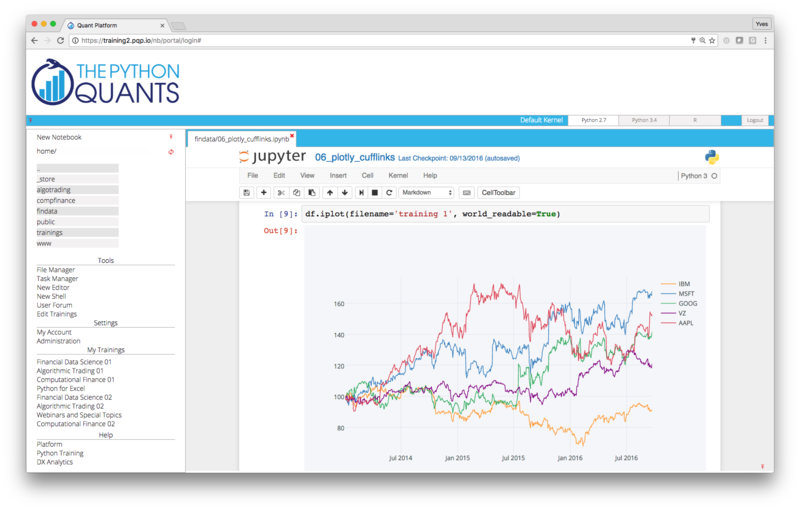 DX Analytics) here http://trial.quant-platform.com or clone the Github repo from here http://github.com/yhilpisch/dx. Bringing back office simulation and risk management practices to front office analytics. Let us start by defining a stochastic discounting object (based on CIR square-root diffusion process). Some simulated short rate paths visualized. The example is based on a multiple, correlated risk factors (based on geomtetric Brownian motion, jump diffusion or stachastic volatility models). The basic assumptions. In addition to the input parameters of the geometric Brownian motion, we also need the following for the jump diffusions and stochastic volatility models. For the portfolio valuation we also need a valuation environment. We generate a large number of risk factors (with some random parameter values). Correlations are also randomly chosen. We model a certain number of derivative instruments with the following major assumptions. The derivatives_portfolio object we compose consists of a large number derivatives positions. Each option differs with respect to the strike and the risk factor it is dependent on. All is together to define the derivatives portfolio. The correlation matrix illstrates the market complexity. The call of the get_values method to value all instruments. The resulting table with the results. We take out a single option from the portfolio and have a closer look. A plot of ten paths of the underlying risk factor. Valuation of the option and Greeks. Deriving values, deltas and vegas for different initial values. Full distribution of portfolio present values illustrated via histogram. The delta risk (sensitivities) report. The vega risk (sensitivities) report. Sample paths for three underlyings. Available as ebook and from December 2015 as print version.